Holidays to Germany and Austria have shown me how differently cultures view low alcohol beer. Set alcohol free drinks aside for a minute, because I want to talk about good(?) old Shandy. As a kid, I was often allowed Lager Shandy at the pub, it gives a child that sense of being the same as an adult but without the effects of alcohol. My Dad would often have Shandy when driving or when drinking pint after pint just wasn't sensible. Shandy is perfect for these occasions. You get some of the flavour of beer, some refreshing Lemonade flavour and no drunkenness. Why then is it viewed with such disdain in England? Order a Lager top down the local and you find yourself checking over your shoulder to make sure nobody heard you. Modern day society enforces the belief that drunkenness is next to manliness. A notion that is completely absurd. As a beer enthusiast, I wouldn't dream of putting a mixer in most beer I drink, through fear of diluting the true taste of the beer. But if you have a stock beer that you drink day in and day out, why not add a little something to it on the days that you're chasing refreshment without the alcohol? 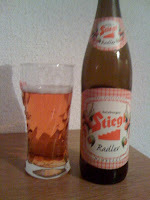 This is where Radler enters the equation. A premixed Shandy you find on supermarket shelves, in bars and on cafe and restaurant menus throughout Austria and Germany. Major breweries all have their versions and proudly brand their products with the same labelling and logos as for their standard and premium beers. Ordering a Radler at lunch time is as normal as a beer or glass of wine with your meal ... and so it should be! Don't get me wrong, I'm not suggesting that I'll start adding Lemonade to all the beer I drink, but there definitely is a time and a place for Shandy. Something the Europeans seem to have worked out, but that the English haven't. Shandy is great. If a pub only sells crappy cooking lager, making it into shandy usually tastes better than drinking it straight. On very hot days, reducing the alcohol content to 2% doesn't hurt either. Good piece, we tried selling Rothaus Radler at The Rake and although it was a decent enough beer, it REALLY didn't work. Until people's drinking habits change it probably won't either. Shame, I'd keep it if it didn't go out of date so damned easily. Barm: Exactly. Shandy on hot summer afternoons is often the best way to go. Rabidbarfly: Didn't work in terms of sales? People just didn't 'get' it? One kinda leads to the other, one thing I've noticed in my 17 years in the trade is that people tend to stick to what they know, they alsop bow to peer pressure when in rounds with friends or collegues. To get them to try something new they either have to be on their own or with a different, more experimental group of drinkers who have come out to try something new, not compete at the drinker olympics. Good points. I guess you can almost "forgive" people for sticking to what they know, when they're at a pub that just sells the same old stuff. At places like The Rake though, I'd sort of hope that people would be more open to trying things.